Yad Mordechai is a kibbutz in southern Israel, sitting roughly 2 miles north of the Gaza Strip. It was established in December 1943 by members of the Ha’shomer Hatza’ir Zionist youth movement who chose its name to commemorate the young leader of the Warsaw Ghetto uprising, Mordechai Anielewicz, also a member of Ha’shomer Hatza’ir. At the outbreak of Israel’s War of Independence in May 1948, Yad Mordechai became the first line of defense against the invading Egyptians, preventing its regular army from rapidly advancing towards Tel Aviv. The fighters, most of whom were members of the kibbutz and had come from the ranks of the youth movement in Europe, had now become among the saviors of the newborn State. In 1968, the Kibbutz opened a new, architecturally groundbreaking museum, dedicated to these two supreme acts of courage: the Warsaw Ghetto uprising, an extraordinary moment of Jewish resistance to Nazism, and the stand against the Egyptians, helping to assure the birth of Israel and the revival of the Jewish people, merely five years later. 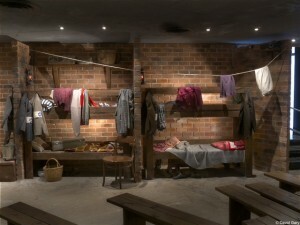 A full-scale reconstruction of the bunker at Mila 18 in the Warsaw Ghetto that served as the headquarters of the uprising. The façade of a typical Warsaw apartment building giving a view through the open windows of Jewish families going about their daily activities at home with the ghetto’s brick wall going up nearby. A painstaking and exact room-size reconstruction-to-scale of the Ghetto, including the connecting bridge of its large and small parts. A scaled-down reproduction of a cattle car used to deport Jews to labor and death camps. 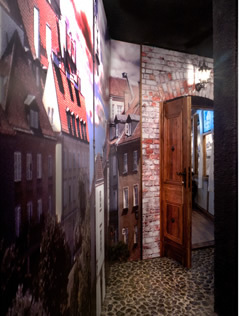 The “Anielewicz House,” a reconstruction of the living room of a middle-class Jewish family in 1930’s Warsaw that also provides glimpses through the windows of the rich variety of Jewish life in Warsaw before it was destroyed, particularly scenes from the time of Mordechai Anielewicz’s childhood and youth. The exhibitions were designed and built by the world-renowned designer and artist David Gafni, among whose creations are the original exhibitions at Beth Hatefutsoth and the Western Wall Cavern museum, as well as the original Yad Mordechai Museum. The Claims Conference proudly supports the educational and commemorative work of Yad Mordechai, which sits so close to the site of this summer’s attacks on the State of Israel. Although Mordechai Anielewicz and most of his compatriots did not survive to fight for a sovereign Jewish state, their heroism and the world they saw destroyed deserve to be studied and remembered today and in coming generations.